1. The floor heat started going in. 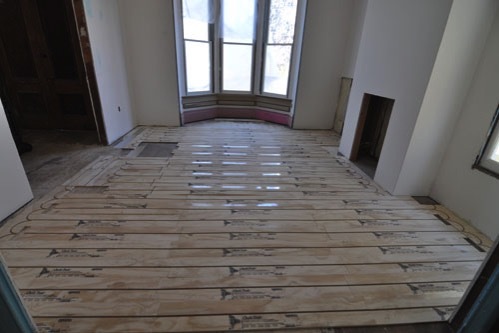 In most of the house, the floor heat is going in via these plywood sheets, which hold the tubing in place. There are a few ways underfloor heating can work: it can be installed below the existing floor, or on top. The heating sub recommended against the underside approach because our existing floor is so thick that we'd waste a lot of energy (the heat would have to travel through the old floor, then through the new floor above). Instead, we are adding about a half inch to the floor thickness. Given that we already had a change in floor thickness issue to deal with anyway, it works out to be less complicated this way. 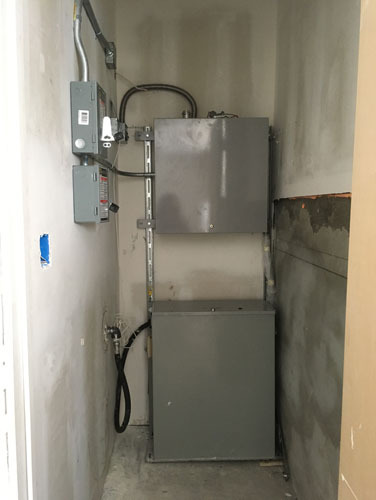 The heating part of this system went in a couple of weeks ago: a tankless hot water system plus a storage tank. 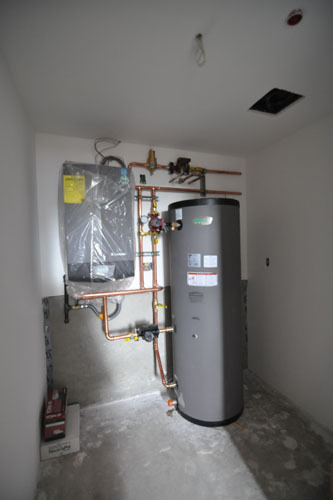 For a house this size, the storage tank allows the system to even out the demand for hot water. 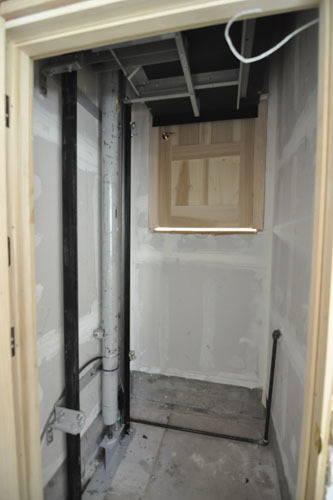 Our system also acts as the water heater for the rest of the plumbing. 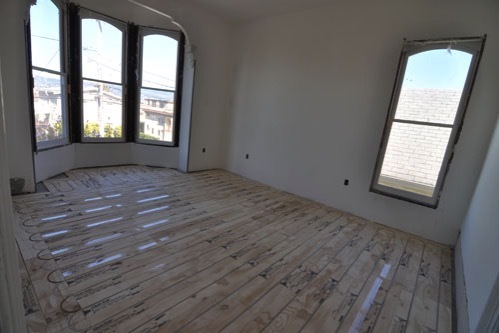 The installation is very systematic: they start by putting down the plywood subfloor that holds the tubing, then they feed the tubing through that. In the front bedroom, here, you can sort of see the tubing in place (it's white, so it is subtle). In the bathrooms, where we have tile floors, the tubing is just stapled to the floor. Then they will put down a mortar bed around it. That gives a more stable surface for tiling. The tilers are still not super crazy about the way the mortar gets thinner above the tubes, but we have some solutions. 2. The elevator is almost all in place. This was what I saw when I opened the door at the bottom of the elevator shaft. The car is sitting above at the kitchen level, but the power is off so it is going nowhere. It's a common misunderstanding that elevator cars just kind of dangle by cables from the top and that those cables can break and drop the car to the bottom of the shaft. 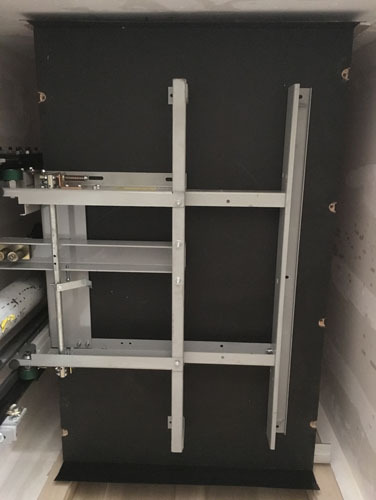 In fact, they are designed so that if the cables or hydraulic lift fails, the car will wedge itself into place and stop moving. That keeps the people in the car alive (there can be some jarring stops that may injure people, but that beats plummeting to your death) until they can be rescued. So basically, do not worry about my standing under the elevator car. The power was off (I checked it myself) and the car was stuck in place like a very expensive closet. I haven't shown you this, yet, have I? This is our very exciting elevator equipment room. I'm thinking of painting the interior pink. 3. We went and chose some cabinet hardware. 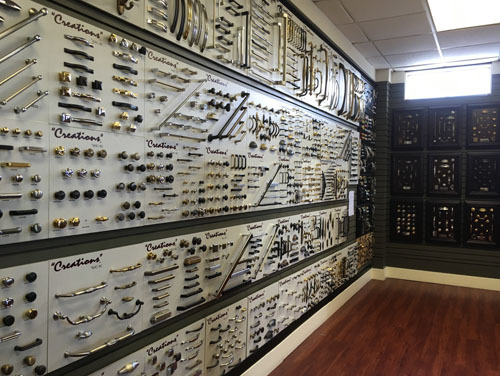 Yesterday we made a pilgrimage out to Walnut Creek to visit Belmont Hardware which is kind of my office's go-to place for cabinet hardware. 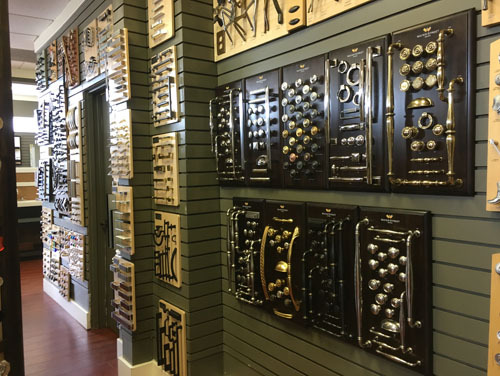 Cabinet hardware can be kind of dizzying, and I don't recommend people buy it online unless they have some experience seeing it in person. A place like this where you can go and touch the hardware in person is invaluable. And yes, you can go there and then shop online for lower prices. But my argument is that if you plan to shop on line to save yourself even a hundred dollars, why don't you try doing that without using a local showroom? See what you spend on buying samples and sending them back when they don't work for you. (A lot of cheap hardware places online charge restocking fees because they know choosing hardware is not easy; there really is no way around the economics of making a living.) If you choose hardware at a local showroom, hardware that that showroom has paid to maintain in a display for you, be a decent person and buy your hardware there, or those local showrooms will cease to exist. Let's stop being the kind of people who think it's not OK for everybody to earn a living, who race to the bottom of the global market. We chose some hardware, but I didn't have the elevations with me to figure out how much of everything we needed. So we didn't buy anything right away. but soon, because if we don't buy stuff soon we will be in trouble. 4. I made some bees angry, but for a good cause. Every winter we have a week or two of incredibly warm, sunny weather in late February or early March. I finally remembered that this is the ideal time to split a hive. Much earlier and there won't be enough bees swarming to make a good queen (a good queen needs to be well mated, and for that she needs a lot of drones, and for that she needs to get to the mating sites when there are a lot of drones there, which is usually around peak swarm season). Much later and we're already getting into our dry summer, and you've missed it. 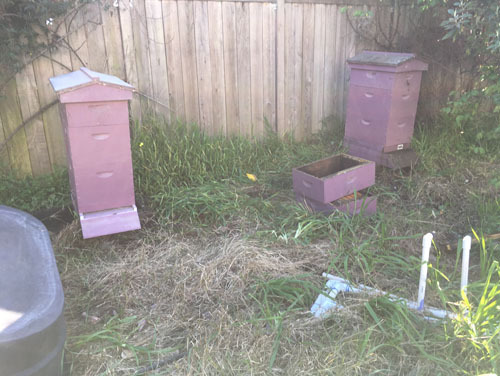 So yesterday I took the hive on the right apart, cleaned it up (there were several frames with mold on them in a part of the hive the bees were not using), divided it in two, and assembled the hive on the left with its frames. I didn't go hunting for the queen (but there were new eggs in the frames so I know she was there) but just did a walkaway split. I'll check on them in a week or so, assuming it's not back to raining again, but they looked pretty good. Surprised that tank isn't strapped; is the installation unfinished? I'm wondering how much noise you'll hear throughout the house from the recirculation pumps; we can hear ours throughout the house (once the kids are asleep.) Ours is for water saving rather than heating floors so I have a timer that turns it off when we are not likely to be using hot water. They are still working on installation. The tank will be strapped (required by code) when it is done, and also a few other details. I have no idea how well the system is designed to avoid pump noise; if it's not done right I know the noise travels through the structure and is basically next to impossible to isolate. But I've had a lot of assurances from this guy. I suppose we will see how it goes and take steps if it isn't working for us. To be honest a little pump noise from the heating system will probably be masked by the constant sound of water flowing into the sump under the house. LOL and thumbs up on the proposal to paint the equipment room pink! You've got to have some homage to the Pepto-Bismol past when this is all done. The pumping rate for radiant floor heating is far lower than what's used for a hot water recirc loop. You won't hear a thing in terms of flow noise. But you might possibly hear the occasional expansion noise as tubing slides around. Even this is not likely though.